Good morning, Friends! I can't believe that this is the last week of February! What beautiful weather we have been having and it makes me think that spring has definitely arrived! I had the windows open for a while yesterday. But I have to admit that I didn't do much of anything yesterday. After I exercised I ended up on the couch watching basketball and then the closing ceremonies of the Olympics. So it was a nice relaxing day for me!! Looking for that motivation and energy to get something accomplished today - lol! 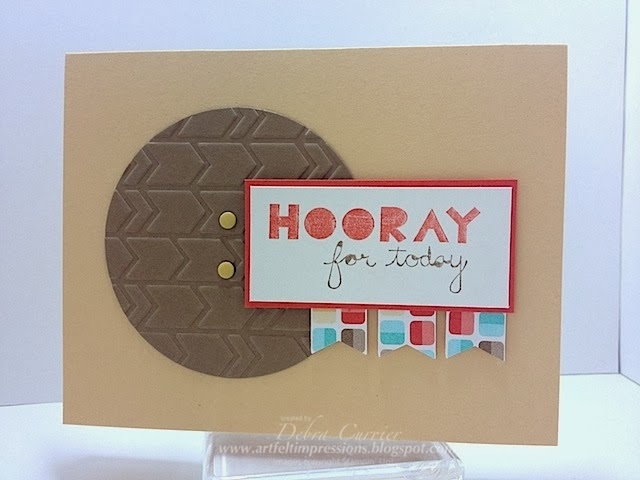 Today's card was one that I did with my stamp club this month. This card was inspired by the sketch from the Monday Lunchtime Sketch Challenge. Pretty simple! Thanks for stopping by and have a super day!